HomeNewsDrones Spots on Prison, What does it want to do? Recently, the Unmanned Aerial Vehicle(UAV) is seen above several prisons in Fuzhou into the night, and flying in diversion and hovering above the dormitory zone, the teaching building, the administrative building and armed zone. The procuratorate of Fuzhou Gushan District claims that the hovering of unmanned planes above may throw in dangerous articles and film the supervision facilities, which will pose threat on the safety of prison management. But why the unmanned planes are hovering are till unknown. The UAV or drones can be used in different places. It is usually used to film the land-forms, to spy upon some mysterious forbidden places, with outstanding commercial and military value. Therefore, by just raising and seeing the unmanned planes, imagination will fly into people’s head. However, the public can no longer be calm when they are seen hovering above the prison. The reason is quite simple, the drones will not just hover and do nothing, and the secret will be just kept among the ones concerned. We hold that we must figure it totally out, even though it is just once of hovering. This is because the prison is the place of military limit, where the polices are paying close attention and nothing should happen in here. The unmanned planes are seen several times above the prison, it is quite weird. We couldn’t help but ask, what does the man operating the plane want to do? The prisons are usually surrounded by polices with strict military management. The area above shall not allow any flying objects. Even though there are no man operating the plane to help the criminals to get out, the drones could film the relevant facilities and obtain some information. Therefore, it cannot be allowed to fly freely above the prison and something should be done to prevent it, or even to ‘get it’. The moment we catch the unmanned plane will we know its purpose right away. The flying aircraft could not be made and fly by anyone. The air management department should play their duties and enhance the force of supervision. The hovering of unmanned planes above the prison is no good news. The department in charge shall not sit by and do nothing. Only by checking out the source of the unmanned plane and getting the reasonable explanation will the public’s concern be answered and their rights of acquisition be satisfied. 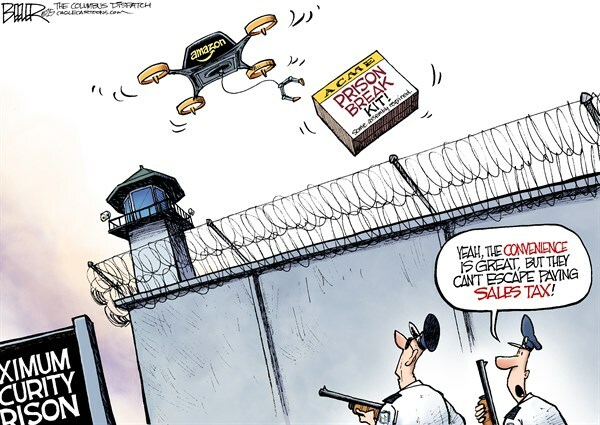 The order of an prison shall never ever be intruded by an UAV. The battle for control of the skies continues. As the amount of unmanned aerial vehicles (UAVs) increases each year, contracting parties are stepping up their efforts to keep the devices out of the air. CTS has now developed a portable, shoulder-mounted rifle, dubbed the Drone Defender, that attacks UAVs with radio waves.